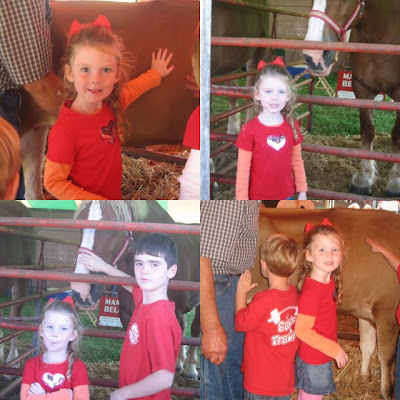 Earlier the year our school visited the County Fair. Clark's class with their teacher, Mrs. Pollock. Bella Ruth milking a "cow". These were the neatest paper sack hats. The children really loved this activity. I can't believe that I didn't get a picture of the finished product. Bella Ruth still has hers in her bedroom. Maybe I can get a picture today. The big turtle was a hit too. Clark finally would pose with this cool animal. He has gotten to a stage where he doesn't want to take the time for a picture. I can only imagine Christmas card pictures this year. Bella Ruth and her buddies, Vincent, Connor and Hayes in the chicken barn. wait to take riding lessons in the Spring.